Fig. (1) Sketch map showing localities of both the Ediacaran Doushantuo Formation of the Jijiawan section in the Yangtze Gorge area, western Hubei, China, and the sampling location (No. YC-06-02). 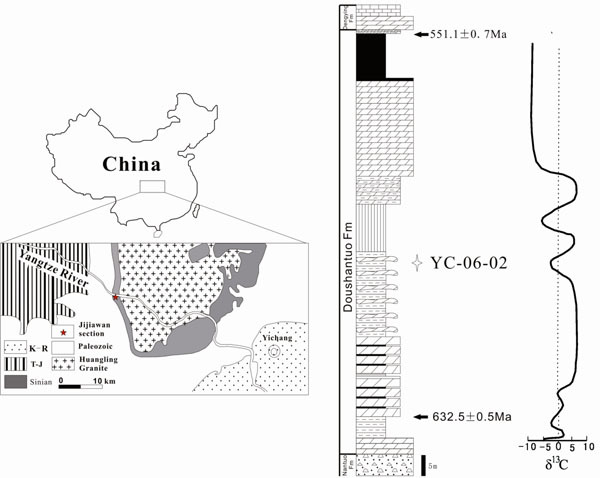 A generalized δ13C stratigraphic column of the Doushatuo Formation by Zhu et al. (2013) indicates that the sampled bed occurs in a negative part of the δ13C curve.